The island of Hydra is connected with Piraeus (Athens), Spetses, Poros, Porto Heli, Hermioni & Metochi (via water taxi). The island of Hydra is connected to Piraeus with Flying dolphins and small catamarans and as it is very close to Athens, the trip lasts only 2 hours. The ferry schedules are quite frequent (especially during the summer period) and the ferry tickets are a bit expensive. During the summer season, there are 4 to 6 routes per day to/from Hydra. You may find more details on this route, through our dedicated page on the ferry route between from Athens to Hydra. Hydra is the queen of the Saronic gulf and a great piece of neoclassical nobility and very picturesque. The town is constructed on a hill and all mansions are made of stone. 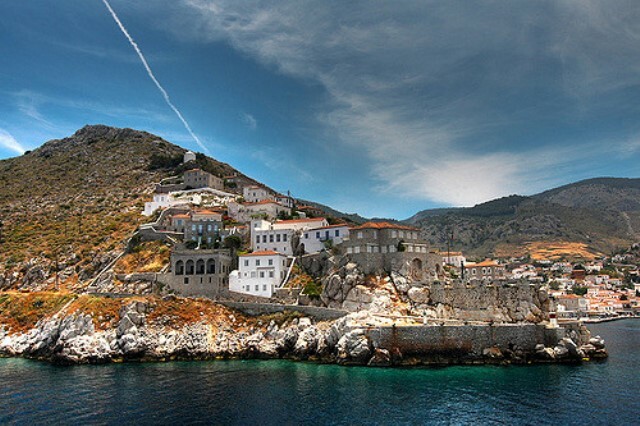 Hydra’s top attractions are Lazaros Koundouriotis historical mansion, the cathedral of "Kimissis tis Theotokou" (dated from the 17th century) with the Tinian-marble bell tower, and the mount Eros. Cars and motors are prohibited and the only mean of transportation are donkeys and water taxis. Regarding the beaches of Hydra, they got a lot of stones and pebbles and usually can be reached on foot. Most of them are rutty and not recommended for babies and toddlers. Hydra is very known for the “Miaoulia” event, the largest one in the island, held each year on June and dedicated to Andreas Miaoulis, an admiral and politician who commanded Greek naval forces during the Greek War of Independence (1821-1829). The celebrations last one week and include exhibitions, lectures, music events, theatrical performances, games, folk dances, sports events, and other activities. If you plan to visit Hydra at this period of time, we sincerely advise booking your ferry tickets and your accommodation quite in advance. Cars and motors are prohibited in Hydra. The only means of transport are donkeys and water-taxis!